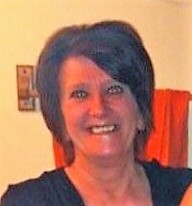 Karen Lynn Kurtz, 61 years, of Fremont, passed away unexpectedly on Thursday, January 17, 2019 in her home on Barton Lake, near Fremont. Karen was born June 19, 1957 in Angola, Indiana, the daughter of Paul and Sharon D. (Hughes) Oliver. She was a 1975 graduate of Angola High School. Karen worked in the Shipping Department of AEP, a division of EMF in Angola for over 20 years. She was a member of the Hamilton Wesleyan Church. Karen enjoyed antiques, fishing, collecting rocks and knick-knacks to decorate her home. She treasured the time she was able to spend with and investing in her family. Surviving are her three children, Steve Kurtz of Angola, Indiana, Robert Brown and Andrea Brown, both of Carnegie, Pennsylvania; two grandchildren, Dericca Kurtz and Brennen Kurtz; her companion, Chris Fraley of Fremont, Indiana; her dad, Paul Oliver of Angola, Indiana; two sisters, Linda (Kenny) Kintz of Hamilton, Indiana, and Suzanne (Frank) Walter, Jr., of Peyton, Colorado; two brothers, Larry (Heather) Oliver of Angola, Indiana and Paul Duane (Candy) Oliver of Angola, Indiana. She was preceded in death by her mother, Sharon and one granddaughter, MaKayla Smith. Visitation for Karen Lynn Kurtz will be held Tuesday, January 22, 2019 from 2:00 – 5:00 p.m. in the Hamilton Wesleyan Church, 4001 Terry Lake Road, Hamilton, Indiana 46742 where a Celebration of Life Service will begin at 5:00 p.m. Tuesday evening with Rev. Dave Leitzel officiating. Interment will be private. Arrangements are under the care and direction of Oberlin-Turnbull Funeral Home, 3985 East Church Street, Hamilton, Indiana. Those planning an expression of sympathy are asked to consider memorial contributions be made to the Steuben County Cancer Association, P.O. Box 28, Angola, Indiana 46703.